The Boston Symphony Orchestra Chamber Players at NEC’s Jordan Hall lent still more beauty to an already beautiful spring Sunday afternoon in Boston. Leoš Janáček’s Mládi found depth and richness in instrumentation by adding the bass clarinet to the wind quintet. This, and another Czech piece by Bohuslav Martinů, his Nonet for winds and strings, might have even suggested summer loveliness and picnics in the countryside. With David Deveau, the Chamber Players elevated the Brahms Trio in A Minor, Opus 114 to indescribable eloquence. Refinement and refreshment ruled. The program that began at the usual shortly-after-the-hour, 3 o’clock, was over at 4:40, perfect for such the day it was in New England. With these chamber players, practicing onstage was entirely absent, their tuning as discreet as possibly could be, and their attire just formal enough to promote what we are all there for in the first place, the music. What an opportunity to have the chance to hear Janáček and Martinů on the same program. Of the two, Janáček is more the craftsman among early 20th-century musical cognoscenti, while Martinů strikes me as more the naturalist who goes ahead with his own leanings borrowed in some way or another from other composers. Understanding Janáček, keeping track of where he is going and what he is up to, does not present much of a problem the way it does with Martinů. Never mind that, the integration of their beloved Czech folk music into both Janáček’s and Martinů’s compositions would be the clearest of any number of connections one could make between these two countrymen. Both pieces, on the first half of BSOCP’s concert, were on the warm side and very much summerlike. Jollity and nostalgia played off each other. Consonances summoned up those summer picnic qualities, dissonances and mysterious harmonies alluded to distant traffic or a brewing rainstorm. BSOCP had it right—just right—all throughout both works. Through tonal prompting, delicate wisps, sunlit dialogues, and dazzling hues contributing to a seasoned temperateness, indoors, was indeed, a sonic reflection of all that was visually so inviting outdoors. That certain summer lightness prevailing before the intermission, gave way to shadows in the Brahms trio. Its length and substance spoke to all that is exquisite and pulchritudinous, which the Chamber Players matched note for note, phrase for phrase, harmony for harmony. The German master’s super crafting of line and counter line, of modulation and cadence, and of gesture and statement surfaced through William R. Hudgins’ clarinet, Jules Eskin’s cello and David Deveau’s piano. Each spoke with his own voice, yet at the same time listening ever so attentively to the others. The coolness and etherealness of the clarinet matched the singing and emoting cello, while both complemented the expansive expression of the piano. It is one of the most transcendent Brahms trio performances I believe I have ever encountered. I do not believe I missed hearing—or feeling—a single sound. I could have sat through yet another performance right there, on the spot. 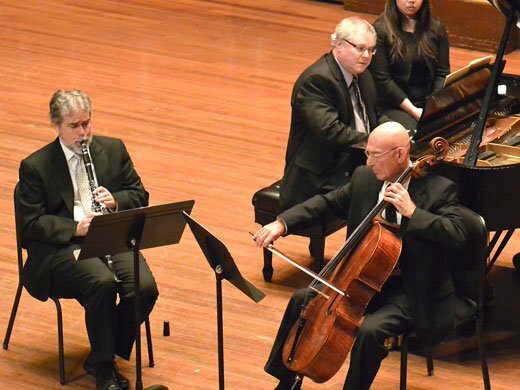 It might be said that the four BSO string players, Martinson, Ansell, Eskin, and Barker, and the six BSO wind players, Rowe, Ferrillo, Hudgins, Svoboda, Sommerville, and Nordstrom, along with pianist David Deveau, fashioned a veritable tonal treasure trove as beautiful and moving as was April’s last Sunday in 2013.